50 years after the Voting Rights Act, a quarter of Americans are still not registered to vote. Carter’s ambitious plan never became law, but 39 years later, states like Oregon and California are embracing automatic voter registration as a bold new voting reform, potentially adding millions of new voters to the rolls. It’s a trend that warrants more attention, especially as the country celebrates National Voter Registration Day today. The Voting Rights Act of 1965 and National Voter Registration Act of 1993 enfranchised millions of new voters. After passage of the VRA, for example, the number of black registered voters in the South increased from 31 percent to 73 percent. Despite these landmark laws, 51 million Americans—1 in 4 eligible voters—are still not registered to vote. “Among eligible voters, some 30 percent of African Americans, 40 percent of Hispanics, 45 percent of Asian Americans, and 41 percent of young adults (age 18-24), were not registered to vote in the historic 2008 election,” according to Demos. During the 2012 election, the United States ranked 31st of 34 developed countries in voter turnout. Yet 84 percent of registered voters cast ballots. The US doesn’t have a voter turnout problem; we have a voter registration problem. Our turnout is abysmal because so many eligible voters are not even registered to vote. Automatic voter registration would change that. 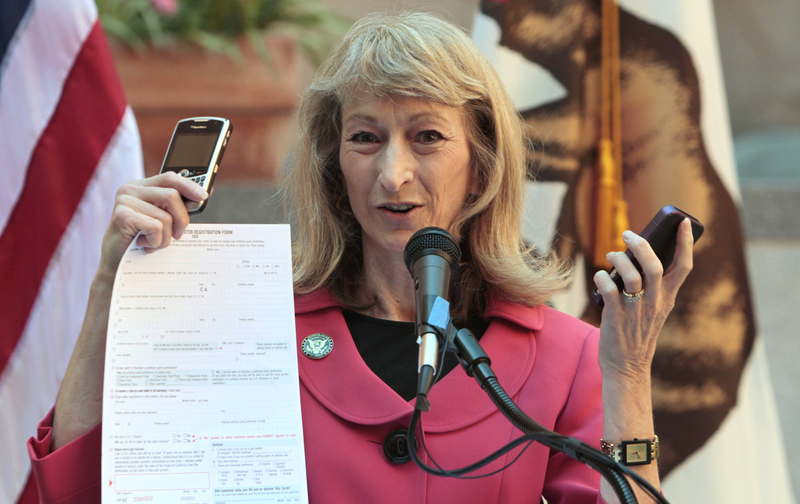 In March 2015, Oregon became the first state to automatically register anyone who requests a driver’s license or state ID from the DMV unless they opt out, shifting voter registration responsibilities from the individual to the state. The law takes effect next year, and Oregon estimates that 300,000 new people will be added to the rolls. Automatic voter registration in California would lead to “the single largest voter registration drive in American history,” says California Secretary of State Alex Padilla. Not every unregistered Californian will be instantly signed up, but “it will only be a few years before a big majority of that group is captured,” Padilla says. The effort to make it easier to register has real momentum. In 2010, 17 states had electronic voter registration and 6 had online voter registration, according to the Brennan Center for Justice. Five years later, 27 states have adopted electronic registration and 24 offer online registration. “There’s tremendous movement on this,” says Myrna Perez of the Brennan Center. But it’s also true that too many states are still making it difficult to participate in the political process, by requiring proof of citizenship to register to vote, eliminating same-day voter registration, hindering voter registration drives, and failing to comply with the NVRA. Voter registration laws have historically been used to exclude people from the democratic process. “There’s a lot of other rights that we don’t have to opt into—freedom of speech, freedom of assembly, freedom from discrimination,” Padilla says. The right to vote should have the same universal protection.